What do a Japanese restaurant, a cell phone, a storm, and a possible tornado have in common? Last July while a group of Easton Village neighbors were clustered around a hibachi at In Japan restaurant, Marsh Weingarden’s cell phone started to ring. Ever curious, he pulled up a severe storm tornado warning for nearby areas. Then he noticed that he was the only one in the full-to-capacity room whom appeared to be alerted to the impending weather issue. Marsh mulled over the idea and decided to create a contest that would involve high school graphic arts students, the Academy Art Museum, and the Talbot County Department of Emergency Services. Talbot County implemented the Citizen Alerts platform in 2014 so that county officials could directly notify, update and provide direction to the community in an efficient, timely manner, should a need arise. Citizen Alerts allows officials to record, send and track personalized voice messages to thousands of residents, businesses, and local agencies in just minutes, through a single phone call. The county can also send text messages to cell phones, email accounts, and TTY/TDD receiving devices for the hearing impaired. Marsh solicited help from Constance Del Nero, Director of ArtReach and Community Programs of the Academy Art Museum, Jim Bass, Emergency Management Coordinator of the Talbot County Department of Emergency Services, and the graphic arts departments at the Easton and St. Michaels high schools to establish criteria for the poster contest and to encourage students to submit their artwork. Marsh was active in the process and also contributed the prize money for the winning first ($100), second ($75), third place ($50), and honorable mention ($25) winners. Staples donated the printing of the posters, which will be displayed throughout the county and publicized by Easton Utilities and Choptank Electric. “We got some amazing artwork for the contest. A number of the kids already knew about the Citizen Alert System. The winning poster design was really clever and eye-catching – we were attracted to it immediately. All the winners will be posted on the Talbot Department of Emergency Services,” states Marsh. The winners included first-place winner Daniel Pritchard, a St. Michael’s High School student (teacher – Chris Pittman; second-place winner Joseph Odenwald, an Easton High School student (teacher – Garnette Hines); third-place winner Ethan Elms, a St. Michael’s High School student (teacher – Chris Pittman); and honorable mention-winner Paige Friedman, an Easton High School student (teacher – Garnette Hines). The public is invited to attend a reception for the winners at Talbot County Department of Emergency Services, located at 605 Port Street in Easton on Thursday, April 12 at 6 p.m. Light refreshments will be served. The first-place winning poster was created by Daniel Pritchard, a St. Michael’s High School student. The poster contest, created by Marsh Weingarden, was created to provide publicity of the Talbot County Citizen Alerts mass notification platform. The winning poster, which was printed for free by Staples will be distributed through government agencies, schools, and local businesses. 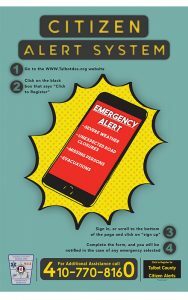 To sign up for Talbot County Citizen Alerts, by visiting the Talbot Department of Emergency Services website at www.talbotdes.org and clicking on the link “Talbot County Citizen Alerts.” Residents can enter their information into the secure database. This is the only way for those residents without a landline to provide their contact information. Those without internet access can have their information added into the system by calling 410-770-8160. Residents can opt-in to provide their complete information, which may include up to three phone numbers, two email addresses, a text messaging number, and indicate if they have a TTY/TDD device.